On the Moroccan Road Trip 2010 we carried a GPS tracker that was used for everyone to track us online. Another benefit of this is that we were able to capture over 800 unique coordinates of our trip, including some additional data such as date/time and occasionally location description and speed. Below is our actual route on the Moroccan Road Trip 2010. This Google Maps was created using only 99 coordinates. However if you want to see a more detailed and interactive version of this map, you can use our Google Earth version of this map below it. You may need the Google Earth plug-in for this. We must thank Bill at Earth Point for his excellent software that enabled us to create this map from an excel spreadsheet. 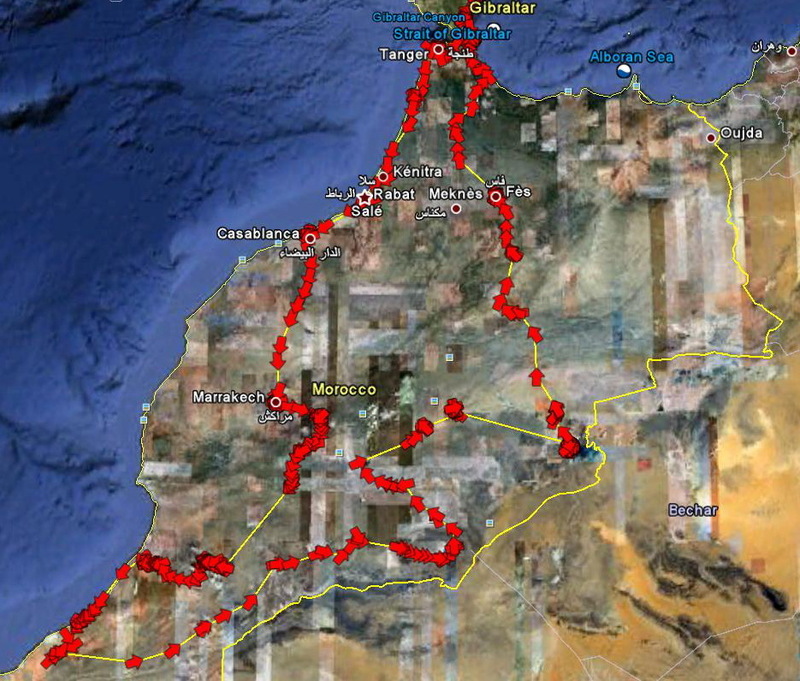 Here is a static map of our route around Morocco. We did this route anti-clockwise. Our original route when we planned it looked something like the below. We've kept this on the website to show the differences between the planned and actual route travelled.